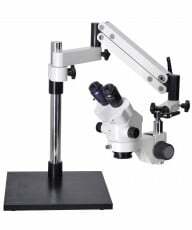 Set the microscope on a flat surface in a stable and comfortable position. Turn on The Transmitted/Oblique illuminator. Place a small solid specimen onto the stage such as a card, coin or any other flat, detailed object. 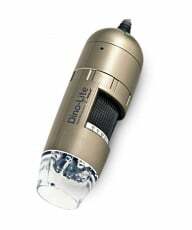 Turn the Magnification adjustment knob to the lowest power and bring the image into focus using the focus control. Adjust the eyepieces for the correct interpupillary distance to suit you. Do this by moving the eyepieces closer together or farther apart until a single field of view is observed (B). Now, set the Dioptric adjustment rings on both eyepieces to the zero position (A). 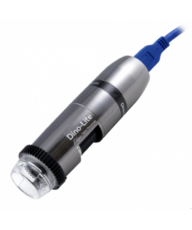 Use the Magnification adjustment knob to set the highest magnification. Bring the image into focus with the focusing knob. Center the image on some clear point of detail on the specimen. 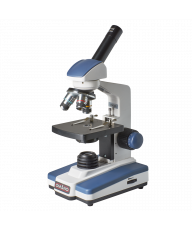 Adjust the microscope down to the lowest magnification using the Magnification adjustment knob. The image could be slightly out of focus. Do not adjust the focus with the focusing knob. Adjust the focus for each eye separately using the eyepiece Dioptric adjustment rings. Your microscope is now "parfocal". 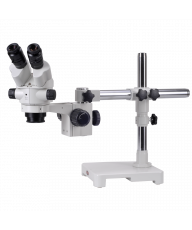 This means that as the microscope is zoomed from high to low magnification the image will stay in focus throughout the entire range. Each individual will have a different setting. Your stereo microscope is now set up. Enjoy!